Hunkering down for the first tropical storm in a while although with every update, it looks more and more like a clean miss. We need the rain but not the wind. It’ll take a few hours to move and tie up all the loose stuff on the dock and porch, so not all that bad, except for the fact that we have a large family party planned for the weekend and I have to untie it all instead of just leaving it for the rest of the season. As luck would have it, Chris is in Hawaii bracing for a couple of Pacific hurricanes about the same time as ours. His looks much worse but he won’t have to tie up a dock or anything. Just hunker down. My truck problems continue although the real bad ones have been resolved – the bad gas tank has been disconnected so my dual tank truck is now a single tank truck. I get about 200 miles on a tank and put on average about 200 miles a month, almost all short trips, so that’s manageable. The cruise control and the speedometer are problematic though. Turns out there’s a speed control sensor that loops to the speedometer mechanism and the cruise control. That sensor doesn’t work consistently. So, for example, the speedometer flops wildly from zero to whatever and the cruise control won’t always engage and when it does, it sometimes drops out. Driving on the country roads, mostly taking Nancy 20 miles to play bridge in Crescent City, these problems are more nuisance than critical and if I get a chance to have it fixed I will. One interesting part of the problem is that in the morning, everything is fine – speedometer and cruise control both work like new. But, in the afternoon, not at all. So I’m convinced it has to do with the ambient temperature – works fine under 85 degrees, not so fine above that. With Nancy not able to drive it’s tricky getting cars fixed but, for sure the ambient temperature will drop out of the 90’s in a couple of weeks and if my theory is correct, I should be home free until next June. On a positive note, the cardio doc said I could stop the blood thinner. It’s been about 16 months since the stents were installed and he said there was little evidence, if any, that continuing the blood thinner was beneficial. I still take a baby aspirin daily just for that purpose. I really hated taking the thinner because the slightest cut or scratch bled like crazy and it’s impossible to work in the jungle without cuts and scratches. Guava jelly anyone? About 10 years ago the neighbors planted a couple of guava trees and now we’re living in a virtual orchard. The fruit get’s eaten by birds and animals and the seeds excreted randomly throughout the jungle. They are really fast growing and turn into substantial trees in just a few years. If they didn’t have these really hard, tiny seeds I’d be putting them in the ninja blender but……. Barbara made guava jelly a few years but has given up on it – too much work she says. I would guess the hard part is straining out the seeds. We’ve really turned the corner on the house project with the near completion of the exterior work. When we started the house was a fully functioning, if not shabby, house – it looked like a house that needed some work and functioned like a house. It needed total internal remodeling but nothing unmanageable. As the internal walls started coming down it became obvious that the total structure was rotted and we marveled that it could still be standing at all. The main support timbers, 8” x 8” pilings, all 18 of them, were so rotted you could push a screw driver or dull knife right through them and most of the 2” x 4” and 2” x 6” internal studs on the ground floor were so badly eaten by termites that you could literally crush them with your bare hands. It all had to replaced. So the more you worked, the larger the job became and the more it went from being a real house to a wobbly skeleton. For a couple of months, no matter how hard you worked, the visual was still an open skeleton, not a house. It was really hard work pouring concrete and reinstalling the main support timbers – months of work – but when that was done, it was still a skeleton and only someone who had seen it before would see forward progress. 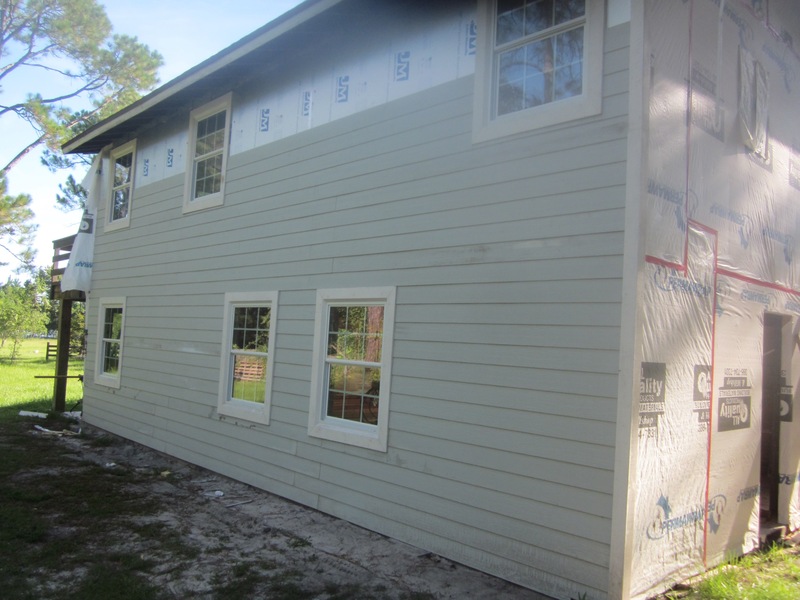 Last weekend we finished the exterior work on one side with siding and it once again looked like a house – a brand new house. Everyone’s spirits were lifted – smiley faces and congratulations all around. This week the doors will be installed, completing the visual and the work will move inside. It needs complete wiring and plumbing before the interior walls are raised so visual progress will be slow for the next month or so. Not sure what the exact schedule is but if it were mine, the AC would be the highest priority so we could do the inside work in comfort. That may not be technically possible but……….. The other really good thing to having the exterior finished is that we’re just starting the serious hurricane season and I have no doubts at all that the place is structurally sound and can ride out anything – well maybe not a tree falling on it – but anything but that. In the battle of the vines, the watermelon is clearly winning over the sweet potatoes. Between the two, they now cover roughly 50% of the total garden area – maybe 600SF. The vines are so thick that it’s hard to get an accurate melon count but I can actually see three, pretty good size ones not too far from where the original plant started. My understanding is that the melons are ready when the attaching stem turns brown. Interestingly, all six of the ones I see are within a few feet of each other rather than spread around as you’d expect. We’re planning a lake event for Labor Day and perhaps we’ll have fresh picked watermelon to complement the barbecue. Another thing of note is that the grasshoppers really go after the sweet potato leaves but leave the watermelon unscathed. I dug around a little with my bare hands under the easiest to get at potato plant and felt a couple of smallish tubers so there is underground action. We hooked up with Tom and Tina last Saturday night for dinner in Deland. Deland has long been nicknamed “deadland” due to the lack of anything resembling a night life but that’s been changing with frequent announcements of grand openings for craft beer, trendy, one off restaurants, cheese and wine social spots, dessert shops and the like. I was blown away by the number of people on the sidewalks and had to leave one brewery because there simply wasn’t any room. Anyway, it was a fun, surprising evening. It’s a big deal in August, in Florida, to lose the A/C. That’s where we found ourselves the other night. Luckily Garrett, George’s grandson and the owner of the house we’re building, is an A/C guy. So all the hours I’ve spent working on his house paid off. He had it up and running a few hours after he found out we were down. I had speculated that it was the thermostat and he was able to confirm my diagnosis in just a few minutes and just happened to have a couple of older, working thermostats including an exact replacement for our defective one. While he was testing he verified that all the pressures and levels for the unit itself were right on the mark. The unit is about 15 years old so it wouldn’t have been a giant surprise if it was failing but he said it all looks just fine. While writing about Garrett’s house, we started the external siding and have about half of the west side done. The siding is 12’ x 7” x 1/2” thick planks made of concrete – a Hardiboard substitute I think it’s going to be a real challenge to keep it all in alignment over the approximately 20’ from ground to roof but so far, so good. By the end of this week, we’ll have the west side completed. It’s not a physically demanding job but requires care in handling the 12’ flexible planks. 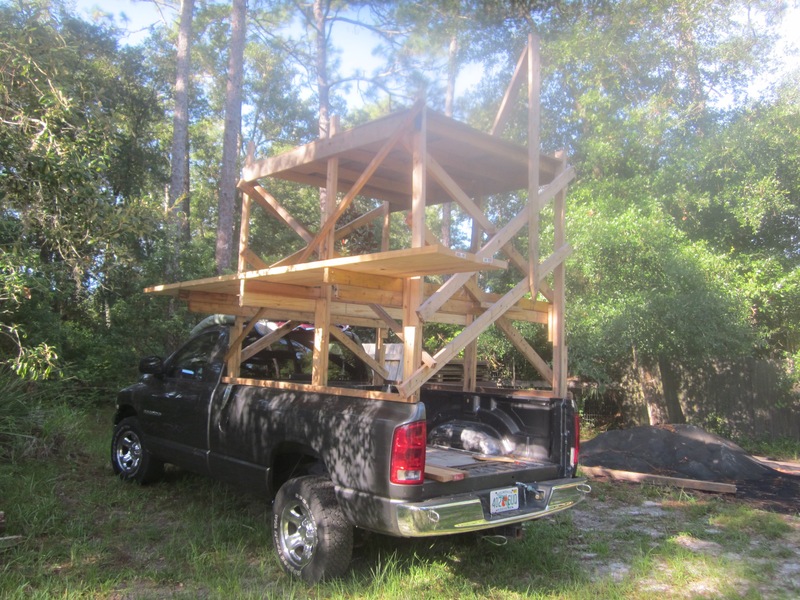 One thing that makes that job easier is the mobile scaffolding rig on George’s truck. He modified it to add a working platform which provides an easier way to cut wood while on the scaffolding plus better access to medium heights. The mystery vine is absolutely confirmed as watermelon. Without really digging down into the vines, I count 5 melons, each in the range of 2 pounds. I would have to guess these will be table ready in September if the critters don’t beat us to them. The vines keep growing and adding blossoms so no telling how this will all turn out. I let the second pineapple go about 2 weeks and it turned from green to gold almost overnight. The interior was much more golden than the first one. Interesting thing about this second one was that it had put out a new shoot on the bottom side so I cut that off and planted both the top foliage and this sucker. If both grow and produce, I’ll have gotten two new plants from this one mother plant which is also still looking good. That makes 13 plants now growing and us officially a pineapple plantation. Joey and Mark came up and helped Nancy and I respectively. I had three dead trees that needed to come down. Two were pines down by the lake which had fallen over more than a year ago but were hung up in other trees such that they weren’t really any problem. One of those created a natural bridge over the path which gave it some character but over time sunk low enough to make the path unusable by some folk. The other dead tree was a fairly large oak right where I like to park the truck. I grew concerned that limbs or even the whole tree would one day crash down on the truck. Mark brought it down perfectly and cut it into firewood for George. Interestingly the oak turned out to be hollow for about half it’s length – the diameter of the tree was 2’ with an 18” hollow core. Squirrels had made several nests in the hollow. Of course the weather turned to rain making the job just a bit messier but we managed to get it all done in about 3 hours. While we were outside dealing with the trees, Joey was cleaning the top of the kitchen cabinets which we really can’t get to any more. So all in all, a good day. Good progress on the neighbor’s house. All the windows and exterior window framing done and the compressed foam sheets installed over the particle board. Those are 4’x8’ compressed foam sheets, 3/4” thick, in a thin metallic sheath. Very light weight, felt like a pound or two at the most and could be cut as needed to fit around windows with a knife so they were a piece of cake to install compared to the particle board. The final outside layer is a thin, 1/2” concrete planking similar to Hardee board. This is a bit trickier to deal with and needs carbide or diamond saw blades to cut. Not sure how long that will take to install but guess at least a week or maybe the rest of August. At that point the exterior is nominally done. All of the old wall board, upstairs and down, has been removed so it’s basically an open shell at this point. I was the primary tear down guy on the second floor. Nancy’s trip to NC is underway, quilt shopping extravaganza. I got to do lots of outside clean up that I can’t get away with when she’s here and also got all the tree hunks over to George’s firewood pile and all the trash wood burned. That was a several hour job in and of itself. After a few days the pineapple picked up a bit more yellow so I decided to clean it. Delicious. I’ll leave the second one on the plant for another week then pick, clean and freeze. These two will go into fruit smoothies for a few weeks and the cut off tops will go into the garden for a future crop bringing the total there to eight. I don’t know whether new pineapples grow on the mother plants where I cut these off but suspect they don’t since the plant has put out new side shoots. If I can keep these all alive and producing, I should have pineapples on hand as needed – although none of the ones I put in the garden almost a year ago are showing any signs of producing fruit. They’re staying alive and taking up space in the garden but so far no real action. New phase on the construction project. All of the particle board siding and window are installed. Next step – add exterior corner, window and door framing. They decided on using rough cut cypress for that and we happen to have a great old time saw mill about 45 minutes away. We were able to pick up about half the wood from their stock and ordered the balance for custom cutting and later pickup. About $1000 later we have all the 2×4’s and 2×6’s needed with lengths from 8’ to 16’ . It took a few days and one burnt out table saw for us to make all the 45 degree cuts, and to paint it all. Installation will actually be the easiest part of it – assuming all the cuts are accurate. Getting it all to fit together perfectly requires pretty good carpentry work – way over my pay grade – but George and Garret are absolutely up to it. Between work at the house and keeping the jungle useable out to the dock takes up about 110% of my time so the garden started looking shabby as plants naturally died off. That process was hastened by a month long stretch of near triple digit heat and a rain deficit of about 90% from normal so I took a couple of days to catch up and get ready for the fall crops. One thing that jumped out at me is that the mystery vine and the sweet potato vines now take up about 25% of the total garden space. It’s hard to believe that the mystery vine originated with one seed from the compost pile so I’m guessing there were more that were hidden from view by the original vine. It’s now sporting a load of blossoms and I actually spotted one tiny, 3” long, melon. It’s green, shaped like a football and has distinct lateral stripes so I’m almost ready to declare it as a watermelon. I’ve bent my pick over the years trying to grow watermelons with zero success so it would be quite ironic if I accidentally produced a crop. If nothing else, when I pull out the vines, I’ll get a full load of compost 3 months later. Ditto the sweet potatoes. Each plant puts out an array of vines which grow longer and longer and even longer. I seem to recall that last time I grew them I swore I wouldn’t do it again – didn’t I?? In a couple of weeks I’m going to work my hands underground where the first ones were planted and see how they’re progressing where it counts. Going to be a bachelor again next week. Nancy and a quilting buddy are going on a road trip to North Carolina to explore quilt shops. Her eyesight or lack thereof, doesn’t seem to stop her activities much. She’s just gradually moved toward less challenging designs and every now and then endures the indignity of having to ask me for some pattern reading.